TabFlip is designed to let you flip through tabs via holding right-click mouse button and then moving the cursor in the horizontal direction, saving you the trouble of having to take the mouse cursor to the tab bar for switching between your open tabs. The extension might seem a bit tricky at first, but it’s fairly intuitive at what it does and can prove extremely useful when switching between web pages in a tab-laden window. 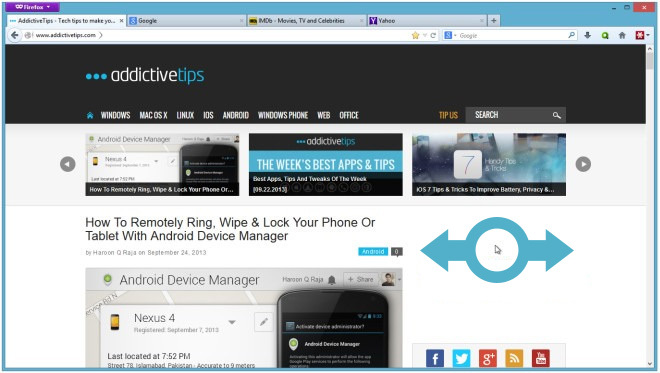 There are two methods in which the app allows you to switch between your tabs. Press and hold the right-click mouse button anywhere on the page, and then move your mouse rightward or leftward; this will result in automatic switching to the next tab after moving the cursor a set distance. When you reach the last tab, TabFlip automatically jumps back to the first tab, thanks to its Wrap option. Wrap works from both sides of the UI, so it doesn’t matter whether you move the cursor from left or right. The Wrap feature is disabled by default, and you can turn it on from the extension’s settings. Coming to the other method, it works in a similar way to the first one, but on the tab bar itself; keep the right-click button pressed and drag horizontally on the tab bar, and you’ll be able to swiftly move between tabs by activating whichever tab your mouse cursor is hovering on. Apart from letting you toggle the Wrap option, the extension’s settings also let you toggle tab bar and page flipping, and provide a handy Flip Distance control. It’s basically the distance in pixels that you need to move your mouse in order to switch between tabs using the first (Page flipping) method. The default value is set to 75, but you can move it up or down according to your requirements.